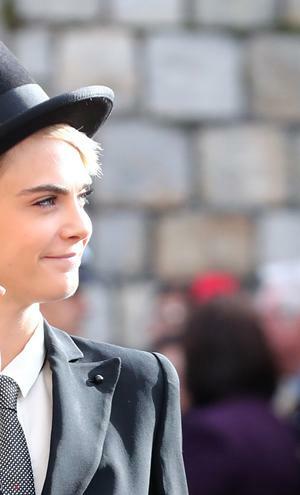 At Princess Eugenie's wedding last month, guests donned all of the usual glamorous finery, but one look stood out: Cara Delevingne's Emporio Armani tuxedo. Complete with a Chanel top hat, stilettos and a toothpick, the model stole the show, and while it might have been verging on stunt-y for a royal wedding, her outfit cemented the suit as the modern occasionwear piece of the moment. With temperatures continuing to plunge, the thought of stepping out in spaghetti straps becomes less and less enticing. If you're looking for something more substantial, the evening suit provides the easy wardrobe solution. When it comes to party season a sleek two-piece is a blessing for office workers: you don't need to cart around a party dress in your bag all day, but can instead wear your suit throughout the day. When it's time to head out, simply throw on a pair of heels, some statement earrings and a slick of lipstick, and you'll be set for the night. A classic black, in the style of Yves Saint Laurent's iconic Le Smoking, is your best bet for dual functionality, and you can go bold as you like with it. Show-stopping sparkles and barely-there sandals are the favoured accoutrements of the Hollywood set, or play it cool with some pointed ankle boots and a shimmering roll-neck top underneath. At an awards show earlier this month, Natalie Portman stepped out in slim tailoring from Hedi Slimane's controversial collection for Celine. It was a surprising change from her standard Dior fare, dictated by her contract as a brand ambassador, but Portman opted for an understated suit rather than Slimane's parade of minidresses, and offered a lesson in sleek, sophisticated suiting with a rock 'n' roll edge thanks to the sheer sequin-lined shirt and sharp red manicure. If you want to make more of a statement with your tux, there is plenty of flamboyant suiting on the high street. It can be as simple as a striking accessory, like the chic brooches on French brand DMN's jackets at Arnotts, which offer a cool counterpoint when paired with crisp white trainers. Or you can opt for a burst of colour, like Peter Pilotto's pink satin suit with contrasting red cord belt (as seen on Beyonce in her Louvre-set video for 'Apes**t' earlier this year). 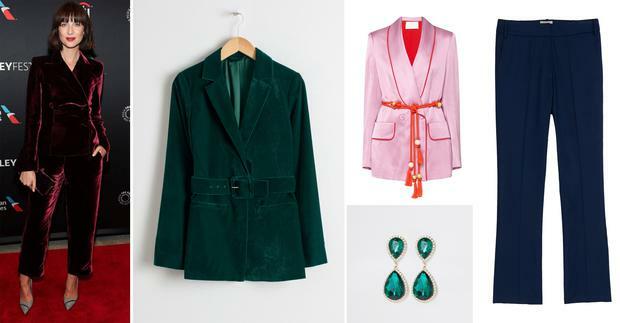 There are jacquard and printed suits about, but for a fail-safe yet festive option, you can't go wrong with velvet. The plush fabric adds a luxe touch to Caitriona Balfe's suit, especially in rich jewel tones like burgundy, midnight blue and forest green. & Other Stories' suit comes in a lustrous shade of emerald, with an accompanying belt to define the waist and help to create an hourglass silhouette. Go bare with just a bra underneath, or try a sheer-ish shirt for a dramatic finish. A slinky camisole is the preferred undershirt for the likes of Victoria Beckham, Meghan Markle and Jennifer Aniston, and Reiss' version is available in black or ivory. Dial up the opulence with dazzling gems, whether in the form of layers of diamanté crystals or gem stone drops. In bags, the box clutch is as popular as ever, or try one of this season's bedazzled pouch bags covered in rhinestones or delicate beading and embroidery. If you're aiming for full 'going out-out' glamour, you can't beat a smart pointed court with a spiked heel, but try it in satin, velvet or M&S's combination of both for added decadence. Rachel Farrell, THEVOW.ie For the little ones in your life, being the flower girl can feel like the most important task in the world.